blueberry oat scone. coffee. book. general sense of composure. goal: recreate scenario on weekday. mornings. remember those? because i had kind of forgotten their appeal. i’m back to being a night owl these days, because it’s just so darn easy to slip later and later, deeper and farther into that cave of pointless internet surfing and all that magnificent tv streaming online… but early this morning i pulled myself out of bed and out the door to have breakfast with an old friend. that’s as good a reason as any to break a bad habit. as i’ve mused of before, i have dreams of moving out of the city… my little blue box of an apartment has its charm, of course; otherwise, i wouldn’t have set my bags down and stayed here so long. but i tire of coming home so late these days to a neighborhood where a girl in heels parking her car in the dark and then click-clacking her way to the front door – well, it’s not exactly safe. i have a dream home in a dream city: one with a porch in front and trees all around, a fireplace inside and great big windows that let in the light, and beautiful hardwood floors throughout. pretty recently, though, i had decided to push the dream a little farther ahead of me. despite the job upgrade i’m still not making enough to get there on my own. but this morning, i’m suddenly feeling just a tad closer to that dream. in catching up with my friend over some bacon and eggs and cups of strong coffee this morning, i discovered we both wanted – anxiously – to move to the same area. to drop the parts of our lives we didn’t quite like, keep the parts we did, and move on. because as undecided twentysomethings, that is our luxury. that’s the nice thing about seeing an old friend again: sometimes, despite losing touch, you find your lives have been pulsing to similar rhythms. the lessons you’ve learned mirror each other’s; your farthest-reaching dreams somehow coincide. so, folks, the dream lives on. despite being young, independent, carefree (“carefree”), etc. etc., sometimes the hardest thing for me to remember is that forever hasn’t happened yet. life is full of surprises and sudden little tips and twists. and some of them are bound to be the good kind. and nibbled a bit more at the book i am reading oh-so-slowly. 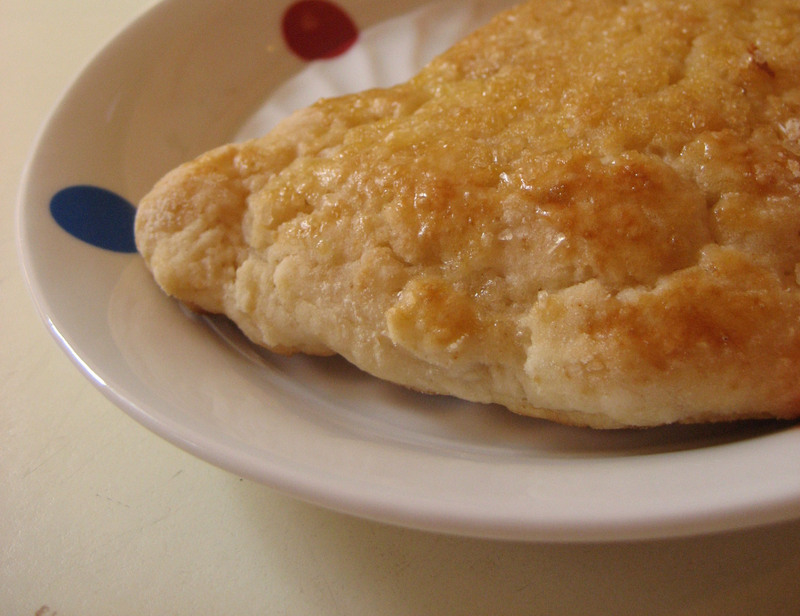 this is a lemon ginger scone. 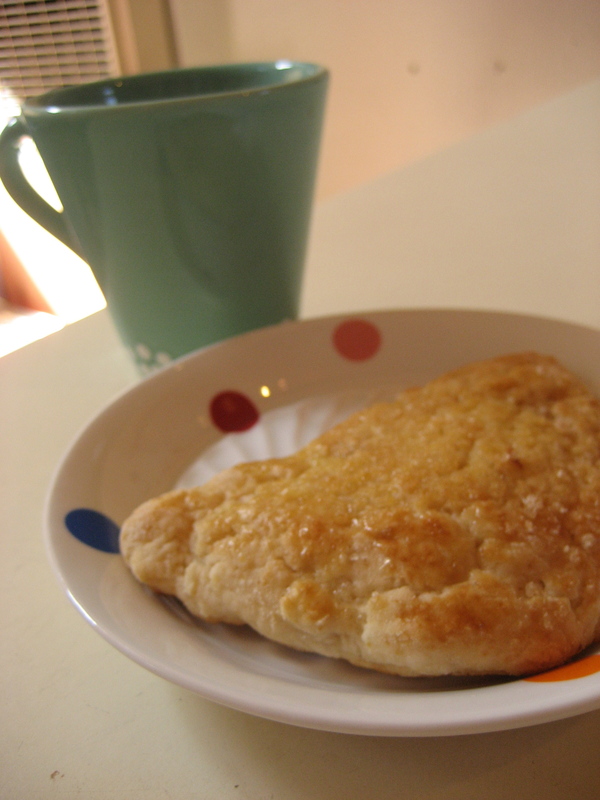 it looks so innocent and lovely here, baked up all golden and sugar-sparkled, sitting pretty next to a hot cup of coffee. but before getting into the oven, boy was that dough an uncooperative mess. it was wet and sticky and managed to gum up my pretty little fingers even after an exuberant dusting of flour everywhere. so, they’ve made it here. i may save this recipe for a part two, though, in which i will up the lemon zest about 200% and figure out a way to get the dough to behave. a large ice cream scoop may be involved. Make a well in the center and pour in the half-and-half. Fold everything together just to incorporate; do not overwork the dough. Press the dough out on a lightly floured surface into a rectangle about 12 by 3 by 1 ¼ inches. Cut the rectangle in half, then cut the pieces in half again, giving you 4 (3-inch) squares. Cut the squares in half on a diagonal to give you 8 triangles. Place the scones on an ungreased cookie sheet and brush the tops with the egg wash. Sprinkle generously with raw sugar. Bake for 15 to 20 minutes until golden brown.